This is an over-view of my hometown, Wolfville! I love it so much and I know I will never foget it if I ever move when I'm older. I have been all over this great little town and I am still amased by it's beauty. Considerably more modest and old fashioned than the new malls of New Minas. It closed in May, 2000. Now there is somekind of coffee shop or something there. The start of the homecoming parade in Wolfville, Nova Scotia, 1996. An everyday Wolfville street view. Overlooking the Annapolis Valley, is the Look Off Point. ^ View from "the Lookoff" on the North Mountain, looking towards the South Mountain. 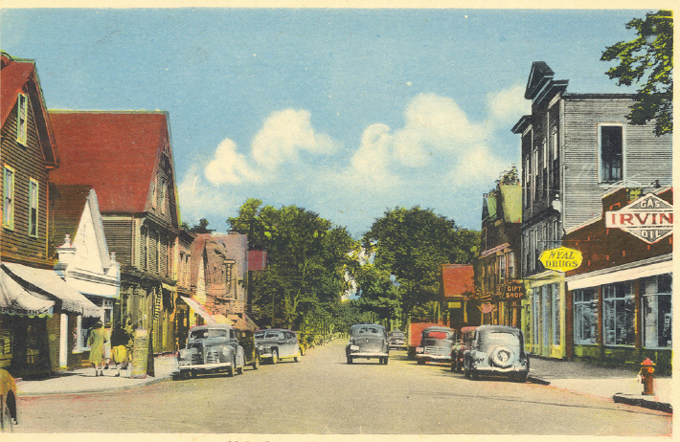 I thought that it was neat that I found this old picture of main street way back when. I'm going to take a geuss and say it was in the 20's. Most of the buildings you see here and still there, where you see "Irving gas" is where "The Market" is now.